Samuel, Books of: The LXX. translators regarded 1 and 2 Samuel and 1 and 2 Kings as forming one continuous history, which they divided into four books, which they called "Books of the Kingdom." The Vulgate version followed this division, but styled them "Books of the Kings." These books of Samuel they accordingly called the "First" and "Second" Books of Kings, and not, as in the modern Bibles, the "First" and "Second" Books of Samuel. the history of Saul, and of David in exile (1 Samuel 13:1 - 31:13). over all Israel (2 Samuel 5:1 - 24:25), mainly in its political aspects. 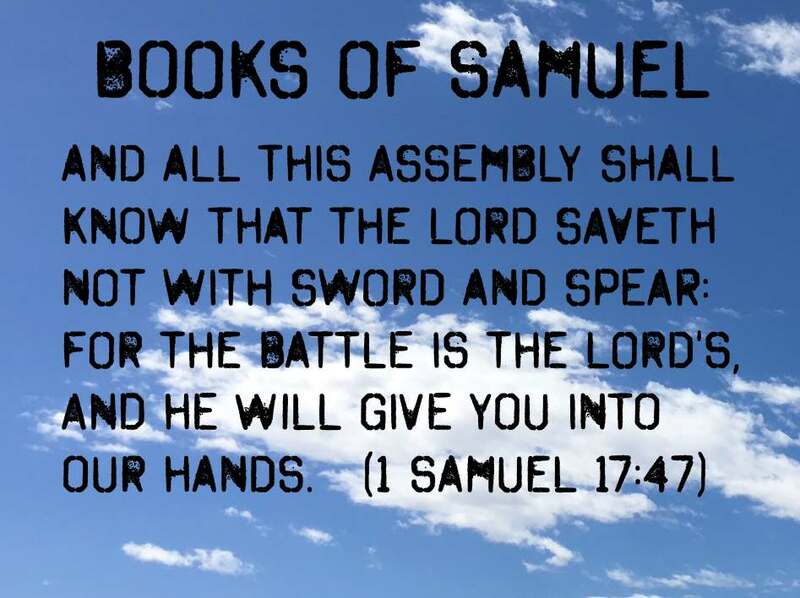 The last four chapters of Second Samuel may be regarded as a sort of appendix recording various events, but not chronologically. These books do not contain complete histories. Frequent gaps are met with in the record, because their object is to present a history of the kingdom of God in its gradual development, and not of the events of the reigns of the successive rulers. It is noticeable that the section (2 Samuel 11:2-12:29) containing an account of David's sin in the matter of Bathsheba is omitted in the corresponding passage in 1 Chronicles 20:1-8. This description of Samuel is from Easton's Bible Dictionary. Samuel: heard of God. The peculiar circumstances connected with his birth are recorded in 1 Samuel 1:20. Hannah, one of the two wives of Elkanah, who came up to Shiloh to worship before the Lord, earnestly prayed to God that she might become the mother of a son. Her prayer was graciously granted; and after the child was weaned she brought him to Shiloh nd consecrated him to the Lord as a perpetual Nazarite (1 Samuel 1:23 -2:11). Here his bodily wants and training were attended to by the women who served in the tabernacle, while Eli cared for his religious culture. Thus, probably, twelve years of his life passed away. "The child Samuel grew on, and was in favour both with the Lord, and also with men" (1 Samuel 2:26 comp. Luke 2:52). It was a time of great and growing degeneracy in Israel (Judges 21:19-21; 1 Samuel 2:12-17, 22). The Philistines, who of late had greatly increased in number and in power, were practically masters of the country, and kept the people in subjection (1 Samuel 10:5; 13:3).